This past weekend was my baby shower. It was truly so special to share our soon to be little girl with our family. I feel so lucky and blessed that both sides of our family are here in Chicago and were all there to celebrate. Being 9 months pregnant, it gave me something to get dolled up for (in pink of course) ! I wore this gorgeous pink pleated maxi skirt that is not maternity and sat right above my bump. 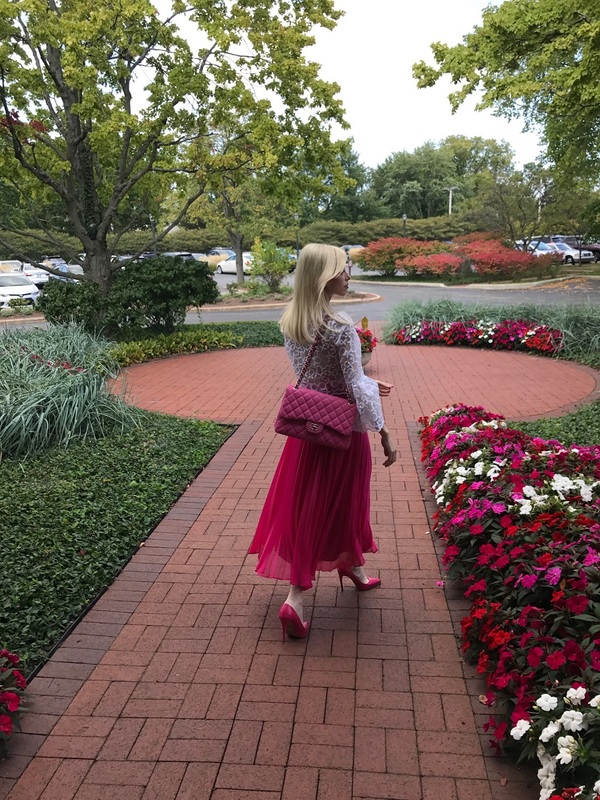 I styled it with a cropped white lace blouse and wore matching pink pumps and carried my pink Chanel bag. I just scream PINK!! It’s still so surreal to me that our little princess will be here in just a couple of weeks! My husband and are putting the final touches on her nursery and it’s all starting to get a little too real! I am really looking forward to being a mommy. If motherhood is anything like the feelings I have had over the last 9 months while carrying my little girl, I can only imagine how truly special it is.